16-Jun-2007 -- I have been looking forward to completing my first confluence for quite some time now, and I though it would be good to visit one that had not been previously visited. So when my wife got transferred to Halls Creek, a small town in the remote northwest, I decided that this would be my chance to visit some. We started out from Halls Creek on the Friday afternoon and made it about 150km down a pretty rough gravel road by nightfall. We set up camp at Marella Gorge and settle in for the night. The next day we did some exploring until lunch time, and then decided to go for the confluence. About 30km further down the gravel road we hit the WA/NT border and saw that the way towards the confluence was blocked by fences. As we contemplated the 6km round trip walk, I saw what turned out to be a gate and we proceeded off road in the Land Rover. After a very rough track and a creek crossing we came across the area. This Confluence is 3km north of the Buntine Highway on the WA/NT border. 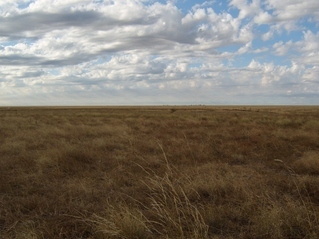 The Confluence is in the middle of a cattle paddock. There is a small dam a few hundred meters to the North West. We took the required photos and proceeded back to Marella Gorge for the night, returning to Halls Creek on the Sunday. The demarcation line with the Northern Territory is passing about 55 m east of the Confluence.